The Nature’s Pharmacy course will help you understand how herbs work on the energetic and biochemical levels. You'll learn about the “doctrine of signatures, ” that is, how a plant’s taste, smell, shape, color, texture, form and habitat provide clues to its “medicinal power.” You'll also get a layman's introduction to plant chemistry (phytochemistry or pharmacognosy) by learning about some of the major chemical found in plants that provide their healing properties. You'll learn about twelve basic categories of herbs based on their taste, smell, texture and the major chemical constituents found in them. You'll learn about how plants in each of these categories affect the human body and be provided with detailed profiles on plants in each category so you can learn to apply this information to healing. 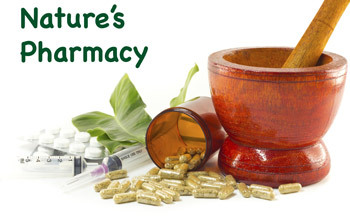 The Nature's Pharmacy course will be taught via webinar and online instruction. You will also receive a packet containing herbs that we are going to discuss in this course. This will allow you to feel, smell, taste and experiment with each herb as we talk about it. There are eight lessons in this course as follows. In our first lesson we'll briefly discuss the idea that herbal medicine is an extension of nutrition and introduce a model for understanding herbs based on their direction of action, degree of action and site of action. This will be followed by an overview of some of the major constituents found in medicinal plants. In this lesson we'll talk about constituents that make herbs pungent and/or aromatic, such as essential oils, resins and alkamindes. We'll do an in-depth profile of three pungent herbs (capsicum, ginger and garlic) and five aromatic herbs (chamomile, catnip, peppermint, thyme and rosemary). For each herb, we'll talk about its chemistry, properties, energetics and uses. Bitter herbs fall into three main categories: aromatic bitters, alkaloidal bitters and non-alkaloidal bitters. In this lesson, we'll talk about the constituents in each of these categories, such as sesquiterpene lactones, triterpenes, alkaloids, diterpenes and glycosides. We'll cover two fragrant bitters (wormwood and yarrow), two alkaloidal bitters (goldenseal and Oregon grape) and four non-alkaloidal bitters (milk thistle, feverfew, hops and cascara sagrada). In this lesson, we'll cover a very special class of herbs—those with an acrid taste—and a very common category of herbs—astringents. We'll discuss the constituents of each class and then cover four acrid herbs (black cohosh, echinacea, kava kava and lobelia) and three astringent herbs (bayberry, uva ursi and white oak). We'll include two herbs that contain salycilates, giving them analgesic properties (black cohosh, which is also acrid, and willow bark). The salty taste is a sign of a high mineral content, salts of calcium, magnesium, sodium and potassium. Salty herbs are used to regulate fluids and to promote healing of tissues. In this session we'll cover five salty herbs (alfalfa, dandelion, mullein, nettles and red clover). We'll also cover two herbs that aren't salty, but are appropriate to discuss in this group—horetail, a good source of silica and other minerals, and burdock, a mild nourishing alterative. A sour taste in herbs is a sign of the presence of organic acids, such as vitamin C and citric acid. It is a good indicator for cooling, antioxidant activity in a plant. In this session we'll discuss eight sour herbs (billberry, elderberry, hawthorn, lemon, plantain, raspberry, schizandra and wolfberry or lycium). The herbal taste of sweet isn't like sugar. It's kind of a bitter-sweet flavor. The herbs in this class are tonic herbs, typically used to moisten tissues, balance glandular functions and counter the effects of aging. Some are also adaptagens and immune tonics. We'll cover six herbs in this category (astragalus, bee pollen, dong quai, eleuthero, Asian and American ginseng and licorice) and two other herbs that act as tonics to the system but aren't sweet in taste (gotu kola and reshi mushroom). These herbs are bland, slimy or oily. Mucilagionous herbs contain water soluble fibers that give them cooling and soothing properties. Oily herbs are those with a high oil content that are sources of essential fatty acids. We'll cover six mucilaginous herbs (aloe vera, comfrey, kelp, marshmallow, psyllium and slippery elm) and two oily herbs (flaxseed and evening primrose). Required For: Certified Herbal Consultant program. Can be purchased separately or as part of the CHC program. Prior completion of the Nature's Pharmacy correspondence course meets this requirement. Course Fee: $247, $50 discount for herbiverse members. Price includes a kit containing a small sample of all the herbs we'll dicuss in detail in the class.